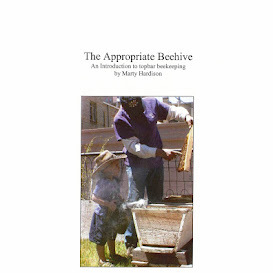 Backyard Bee Hive Blog: How much space does a beehive need? "I'm thinking about starting beekeeping. How much space does a beehive need?" asked Skylar. It's a great first question but I feel like there are so many other questions a budding beekeeper should ask before that one. Hindsight's 20/20 I suppose. Only after you've kept bees for a while do you realize that the space requirement is not the #1 consideration. Nevertheless, I'm going to try to answer the question in as short a post as possible. One beehive needs as much airspace as you can offer. Extrapolating the flight path of the bees in this video by even just 10 feet should give you an idea of how much space a beehive needs. Young bees learning the location of their hive. Older bees returning to the hive with nectar. P.S. : If you're buying bees for 2017, Colorado bees from Grampa's Gourmet go on sale Monday the 9th! Great answer! Even if the ordinance isn't as specific as Aurora's, it's important to be a good neighbor by making sure your bees won't fly into your neighbor's summer parties. For example, Longmont's ordinance just says, "The keeping of bees in any greater number than four stands at any one place is a nuisance."). And another issue is that your HOA may have even more restrictions so check with them if you have one. It's also a good idea to have plenty of water sources in your yard for your bees. Bees love the neighbors' dog dishes, swimming pools and bird baths. My neighbor moved the dog's dish inside which was very kind of him. Talking to your neighbors before hand about your plans to have bees and plying them with honey and beeswax salves afterwards goes a long way to reducing complaints (and possible pesticide kills). All excellent points, @Don. Love the vagary of Longmont's ordinance! Pretty much gives you license to do as you please. That's awesome. Good post! Definitely important to know your town's ordinances. Also, if you want CNG certification, the recommendation is "Six or fewer hives in a suburban area (residential lots less than one acre each)."